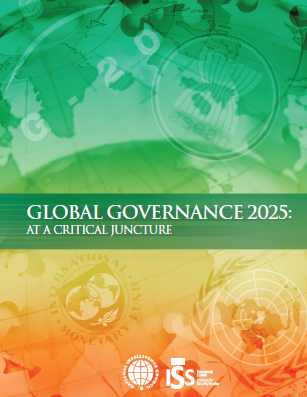 Global governance—the collective management of common problems at the international level—is at a critical juncture. Although global governance institutions have racked up many successes since their development after the Second World War, the growing number of issues on the international agenda, and their complexity, is outpacing the ability of international organizations and national governments to cope. With the emergence of rapid globalization, the risks to the international system have grown to the extent that formerly localized threats are no longer locally containable but are now potentially dangerous to global security and stability. At the beginning of the century, threats such as ethnic conflicts, infectious diseases, and terrorism as well as a new generation of global challenges including climate change, energy security, food and water scarcity, international migration flows, and new technologies are increasingly taking center stage. Three effects of rapid globalization are driving demands for more effective global governance. Interdependence has been a feature of economic globalization for many years, but the rise of China, India, Brazil, and other fast-growing economies has taken economic interdependence to a new level. The multiple links among climate change and resources issues; the economic crisis; and state fragility—“hubs” of risks for the future—illustrate the interconnected nature of the challenges on the international agenda today. Many of the issues cited above involve interwoven domestic and foreign challenges. Domestic politics creates tight constraints on international cooperation and reduces the scope for compromise. The shift to a multipolar world is complicating the prospects for effective global governance over the next 10 years. The expanding economic clout of emerging powers increases their political influence well beyond their borders. Power is not only shifting from established powers to rising countries and, to some extent, the developing world, but also toward nonstate actors. Diverse perspectives and suspicions about global governance, which is seen as a Western concept, will add to the difficulties of effectively mastering the growing number of challenges. Crises—so long as they are not overwhelming—may actually spur greater innovation and change in the system. Inaction over the long term increases the risks of a complete breakdown. In this scenario, seen as the most likely one over the next several years, no one crisis will be so overwhelming as to threaten the international system even though collective management advances slowly. Crises are dealt with ad hoc and temporary frameworks or institutions are devised to avert the most threatening aspects of them. Formal institutions remain largely unreformed and Western states probably must shoulder a disproportionate share of “global governance” as developing countries prevent disruptions at home. This future is not sustainable over the longer term as it depends on no crisis being so unmanageable as to overwhelm the international system. Powerful states and regions try to wall themselves off from outside threats. Asia builds a regional order that is economically self-sufficient. Global communications ensure globalization does not die, but it slows significantly. Europe turns its focus inward as it wrestles with growing discontent with declining living standards. With a growing work force, the US might be in a better position but may still be fiscally constrained if its budgetary shortfalls and long-term debt problems remain unresolved. Under this scenario, severe threats to the international system—possibly a looming environmental disaster or a conflict that risks spreading—prompt greater cooperation on solving global problems. Significant reform of the international system becomes possible. Although less likely than the first two scenarios in the immediate future, such a scenario might prove the best outcome over the longer term, building a resilient international system that would step up the level of overall cooperation on an array of problems. The US increasingly shares power while China and India increase their burden sharing and the EU takes on a bigger global role. A stable concert could also occur incrementally over a long period in which economic gaps shrink and per capita income converges. This scenario is among the least likely, but the possibility cannot be dismissed. The international system becomes threatening owing to domestic disruptions, particularly in emerging powers such as China. Nationalistic pressures build as middle-class aspirations for the “good life” are stymied. Tensions build between the United States and China, but also among some of the BRICs as competition grows for secure resources and clients. A nuclear arms race in the Middle East could deal an equally destabilizing blow to prospects for continued global growth. Suspicions and tensions make reforming global institutions impossible; budding regional efforts, particularly in Asia, also are undermined.